A few years ago, traveling to Russia was quite expensive, especially to big cities like Moscow or St. Petersburg. However, after the strong devaluation of the ruble, traveling to Russia has become quite affordable for foreign tourists. If you compare the prices of big capitals like New York, London, Paris or Sydney, in Moscow the prices are much more affordable. That image of Moscow as one of the most expensive cities in the world is now far away. 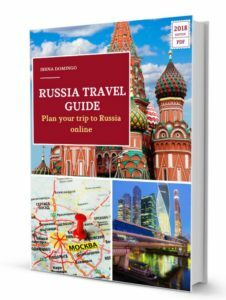 HOW MUCH DOES IT COST TO TRAVEL TO RUSSIA? If you are planning a trip to Russia, one of the first questions you will ask is: How much will it cost me? Is Russia an expensive country? Well, in this article I seek to answer these questions so you can know if Russia is a country that can be considered expensive or cheap to travel. In addition, I will also give you some advice that I often apply myself to considerably reduce the cost of travel. The cost of traveling to Russia is greatly influenced by two factors: the value of the ruble and the standard of living of the country. With regards to the value of the ruble, we can say that the Russian currency has undergone a strong devaluation during the last years. In November 2014 the Central Bank of Russia (BCR) left the ruble in free float, eliminated the exchange band and ended its regular interventions in the foreign exchange market to avoid devaluations of the ruble. Since October 2014, when the exchange rate was around 50 rubles per dollar, the Russian currency has experienced a sharp devaluation to reach 80 rubles per dollar in early 2016. In recent months it has recovered, and as of this writing (December 2016) it stands at around 65 rubles / dollar. The value of the ruble is an element that should always be considered before traveling to Russia. This devaluation has made Russia a much more affordable country for foreign tourists, though it should also be borne in mind that the devaluation of the ruble has generated high inflation in the country (in 2016 it stands at a rate of 7%). As for the standard of living of the Russians, a good approximation to know this is the GDP per capita indicator, which in 2015 was 7,800 dollars (about 650 dollars per month), which puts Russia in the 70th place in the ranking of around 200 countries. 2015 has been a year of recession in Russia, with GDP falling by 3.7%. However, it should be borne in mind that the standard of living and salary in large cities such as Moscow or St. Petersburg is higher than in the rest of the country, where the average salary can reach around 900 dollars per month. The expenses you will incur before leaving home: visa, air ticket and accommodation reservation. The expenses you will incur during the trip: meals in restaurants, public transportation, entrances to museums and cathedrals, shopping, phone and Internet, etc. Visa. 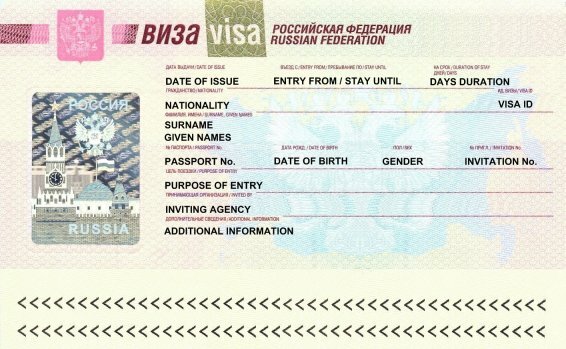 To travel to Russia it is mandatory to have a visa, which, if you do it on your own, can cost about $209 (including the letter of invitation and health insurance). This is a fixed cost which no one can escape. More information on this article: How to obtain a Russian Visa in the USA or Canada in an easy and cost-effective way. Registration. Another cost that some accommodations can charge is the check-in at your arrival (between $5 and $10), but the usual in hotels with 3 or more stars is that they don’t charge anything for this service. Being a distant country makes the cost of transportation also more expensive. 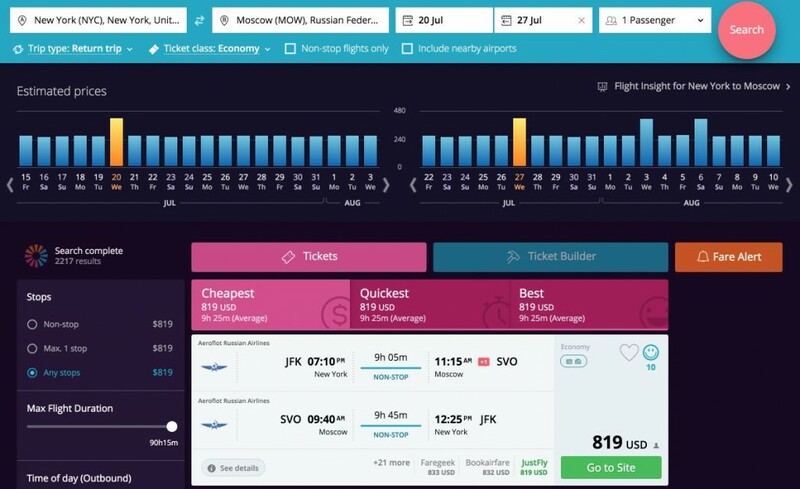 Since the majority of people traveling to Russia do it by plane, the cost of the round trip ticket on average from USA can cost in summer around $800 per person (if you book in advance), though if you do a trip with stops, you can reduce this cost (more information in this article: How to find the cheapest flights to Moscow and St. Petersburg). Average cost of the round trip air ticket: $800. Accommodation is usually reserved and paid in advance. Its price will depend on your budget. It will be more expensive if it’s located to the city’s center and also during the summer, though often prices depend on demand. Low cost accommodation. You can stay in hostels, even in the center of Moscow (with shared rooms) for a very low price (between $5 and $10 a night), though if you are looking for cheap accommodation but with a non-shared room, the prices per double room begin from $20. Medium-cost accommodation. The average price for a double room in 3 and 4 star hotels (or in good Airbnb apartments or similar platforms) would be between $50 and $150, depending on the location and the services offered. Luxury accommodation. A night in a double room in a five-star hotel can range from $100 (the average five-star hotel) and $400 or more per night in a centric 5-star hotel, such as the Lotte Hotel in Moscow, or the Metropol Hotel. More information on this article: Accommodations in Russia: How to choose and where to make a reservation cheaply. Public transport in Russia is very cheap, the Metro, the buses or the trolleybuses. A simple Metro trip in Moscow costs 50 rubles. 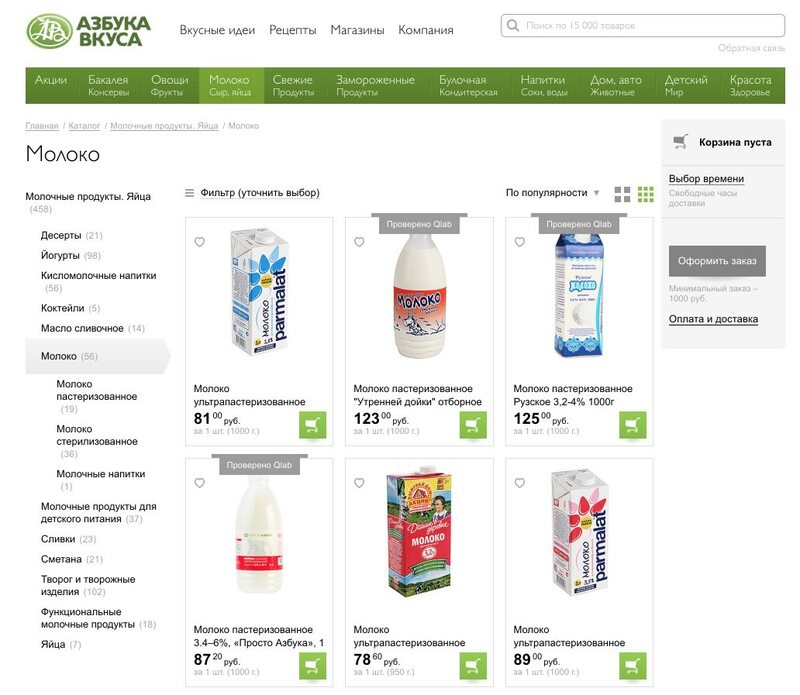 If you buy a card, for example, of 20 trips, the cost is still cheaper, 580 rubles, i.e. 29 rubles each trip (in addition you can share the ticket among several trips). If you buy the Troika card (it’s only 50 rubles), you can recharge it and still have cheaper prices and with the possibility of combining several means of transport like bus or the trolleybus. Taxis are not too expensive and it is a good means of transport for those trips where you have to combine several means of public transport, or the airport transfers to the city center (which can cost about 2,000 rubles). It is worth remembering that in Russia gasoline is very cheap, since it is one of the main countries of the world that produce oil, so if you rent a car (which is not recommended for traffic jams in big cities), gasoline will result very cheap. Traveling on long-distance trains is not expensive, either. You can travel from Moscow to St. Petersburg (a 700-kilometer trip) on a high-speed train (Sapsan) for about $30 (one way), or with a dorm train like the Red Arrow for about $80 in a second class compartment (one way). Though these prices can be variable depending on the time of year, the days in advance in which you reserve the train tickets, and demand. The plane is also a cheap transportation method. Thus, a one-way trip from Moscow to St. Petersburg can cost around $20. More information on this article: Traveling between Moscow and St. Petersburg: Which is the best way?. Walking tours. There are companies that make introductory guided tours to the city for free, though they are financed through tips left by tourists, such as the Free Moscow Tour Company. If you want to do a more specialized guided tour, such as a guided tour through the Moscow Metro or through the Kremlin, then the prices per person can oscillate between $15 and $50. Tour bus. Taking the city sightseeing bus in Moscow costs $11 a day. Boat cruise in Moscow or St. Petersburg. Depending on the chosen cruise, the cost can vary between $10 and $30 per person. Boat to Peterhof. Going to Peterhof on a Hydrofoil boat costs about $10 (one way trip). Assuming that you do a walking tour ($15), a boat cruise in Moscow ($10) and the boat trip to Peterhof ($10), the total cost would be about $35. The cost will depend on the cathedrals and museums to visit. Tickets to museums are not too expensive. The price of museum tickets can range from 150 rubles (smaller museums) to 700 rubles (which is the cost of the main Russian museum, the Kremlin Armory), but on average an entrance to a museum in Moscow or St. Petersburg can be around 400 rubles. There are also some small museums that are free. Museum of Cosmonautics: 250 rubles. If you’re going to visit all the attractions above in Moscow and St. Petersburg for 8 days, the average daily cost would be about $10. Fast food chains. It is possible to eat a menu for around 300 and 800 rubles, whether in American fast food chains (McDonald’s, Burger King, Pizza Hut, etc.) 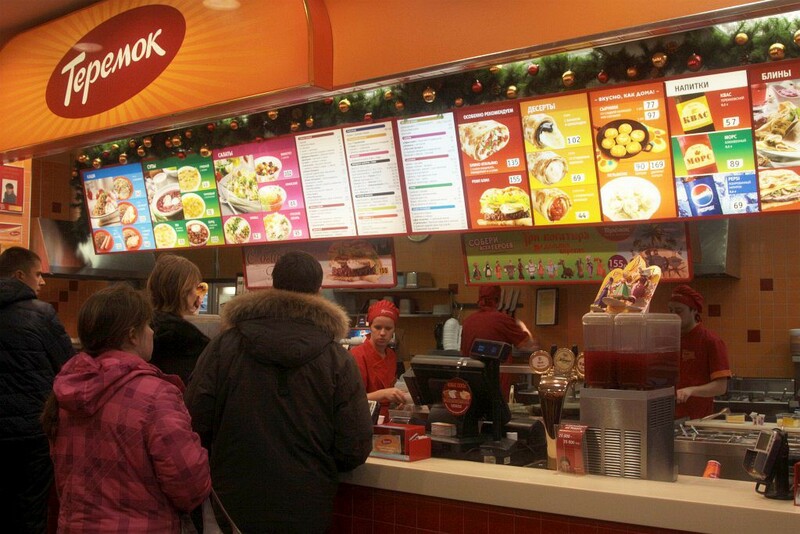 or in Russian fast food chains (Teremok, Kroshka Kartoshka etc.). The average cost of fast food: between $5 and $10 per meal. Buffet style restaurants or with daily menu. 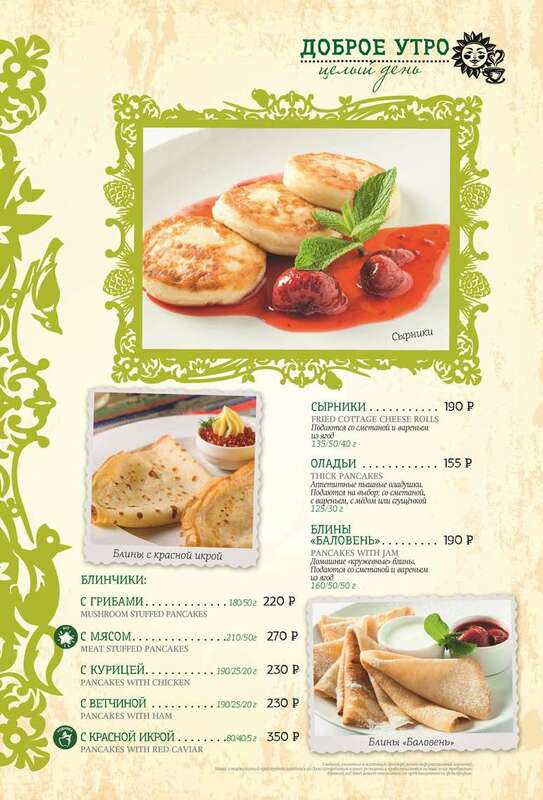 In this type of restaurants the price can vary between 800 and 1,500 rubles per person. Examples: Mu Mu, Stolovaya 57, Grabli, Yolki Palki, etc. Average cost: around $10 and $20 per meal. Restaurants with elaborate cuisine. In this case prices start from 1,500 rubles per person. The restaurants are of the most varied and among them you can find restaurants of Russian cuisine as well as French, Italian or even Spanish cuisine. When choosing a good option you can look up the opinions of other users on Tripadvisor. The average cost of food in a more elaborate restaurant: starting from $20 per meal. More information in this article: Where to eat in Moscow: from Teremok to Café Pushkin. Breakfast may be included in the price of the hotel stay or you can choose to have breakfast outside the hotel. In the latter case, the cost of a typical Russian breakfast (usually served until 12) with pancakes or crepes or with cheese rolls can cost about 200 rubles (about $3). However, you can also order a coffee and a piece of pastries for a similar price. Although these prices can vary widely from one restaurant to another, especially in terms of alcoholic beverages and brands, so these prices are only as a reference. If you are staying in an apartment you may choose to do some shopping in stores, kiosks or supermarkets to eat at home, or simply to buy tobacco or souvenirs. In supermarkets, prices are much cheaper. They are also a good place to buy caviar or souvenirs since prices tend to be less expensive than in tourist places. Tobacco is not expensive in Russia. An American packet of cigarettes can cost about 100 rubles on average (note: you can’t get more than 1,000 cigars or more than 1 kg of tobacco from the country). It is also more than likely that you end up buying a souvenir to take with you to give to a family member or friend (matrioskas, Russian caps, a samovar, vodka, caviar, etc.). Well, their prices can be very variable. You can have a look at them on this Russian souvenir website: http://www.souvenirdvor.ru/. If you use your mobile phone in Russia, the invoice can be very expensive, which is why it is convenient to buy a SIM card from a Russian mobile phone company. For less than 400 rubles, it is possible to acquire a Russian SIM with 400 minutes in calls and 5 Gb of Internet connection. Besides, they are easy to acquire, these are prepaid cards (no need to give any bank account number) and you will only need your passport. You can buy them in many establishments. Of course, you must have an unlocked phone to enter the Russian SIM. More information in this article: How to buy a Russian SIM card for your smartphone. So, it can’t be said that Russia is an expensive country, on the contrary, the strong devaluation that the ruble has experienced during the last years, has made Russia to be rather less expensive than ever. Some expenses are very cheap (such as public transport or Internet connection via a Russian SIM), while others are not so cheap but are reasonably priced (accommodation, restaurants or museums). If you sleep in cheap hostels or economic apartments in Airbnb, you can eat at fast food establishments or in street stalls, buy food or drinks at kiosks or supermarkets, and use public transport (Metro or bus), that is, if you do what much of the local population does, then Russia can be a very non-expensive country. Now, if you do what tourists usually do: stay in 3 or 4 star hotels, eat in good restaurants, visit museums and also use the taxi as a means of transport, then it is not so cheap, but that expensive than what the living standard costs in large European cities. Accommodation reservation: $280 per person for 7 nights in a 4 star hotel ($40 per person per day), taking into account that there will be 6 nights in a hotel and one night in the train in the trip from Moscow to St. Petersburg. Shopping in stores: about $80 per person. Russian SIM card: $5 per person. In total, an 8-day trip, staying in good 4-star hotels and eating in restaurants can cost around $1,800 per person, including all expenses: visa, insurance, plane ticket, accommodation, transportation, sightseeing tours, museums, restaurants (breakfast, lunch and dinner), shopping in stores and SIM card. This amount can be significantly reduced if cheaper accommodation is used, and you eat at fast food or more basic restaurants. For this reason, it is also possible to organize a low cost trip to Russia for just over $1,400. File the visa on your own. It is not complicated at all and will cost you about $209 (including letter of invitation). If you turn to agencies, the prices can double or even triple. I recommend booking with at least 3 months in advance, and using a flight comparator to get the best price. If you still want to save more, you have the option of making a flight with stops. It is also advisable to make the trip by plane to Saint Petersburg and the return from Moscow (or vice versa), this way you only have to make a trip from Saint Petersburg to Moscow. 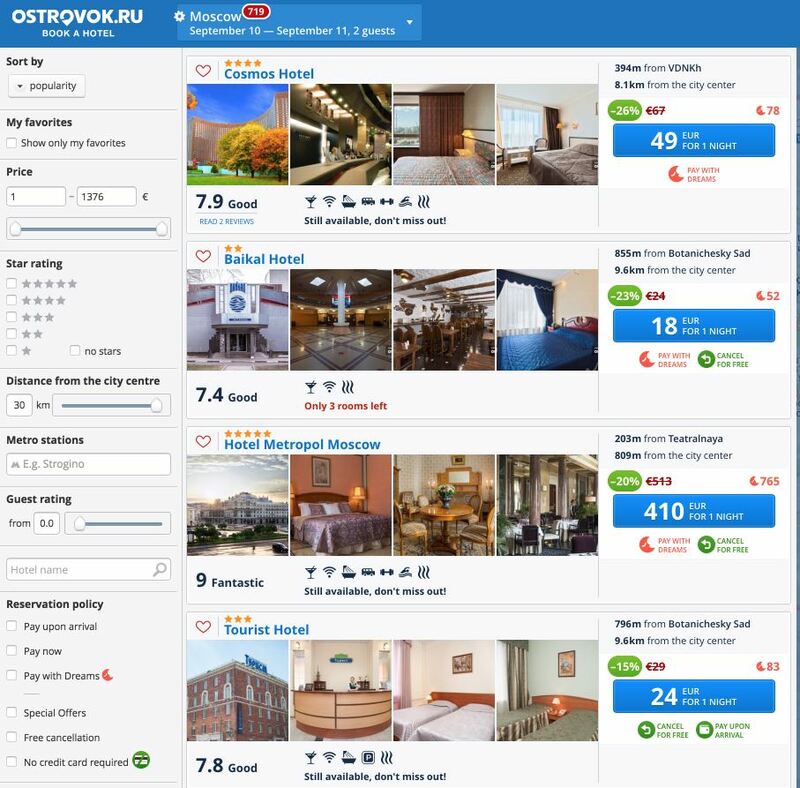 To save on the cost of hotels I recommend using the Russian Ostrovok hotel reservation platform, where you can often find better prices than with Booking. Using Airbnb apartments is also a good option to reduce expenses if you are a group, or you are going with your family. The cheapest and fastest way to get around the cities of Moscow and St. Petersburg is by Metro. I recommend buying a voucher with 20 trips (which can be shared among several people) or buying the Troika card which gives you even better prices and you can also use the bus. I recommend reserving the tickets with at least 30 days in advance and through the official website of the RZD Russian Railways. The Sapsan fast train is less expensive than the Red Arrow night train, but you have to be aware that in the latter case you will save a hotel night. There are also other trains that are less comfortable and with a longer travel time, but with cheaper prices than Sapsan. The invoice can be reduced in museums, cathedrals and guided tours by purchasing one of the tourist cards offered in Moscow (Moscow Citypass) or in St. Petersburg ( Petersburg Card), provided that after making calculations buying one of these can compensate, but this is not always the case). You will also find cheaper (or even free) tickets if you have a student card (don’t forget it) or if you have some handicap. To lighten the restaurant bill I recommend combining Russian fast-food restaurants (on those days when you rush from one place to another) with more elaborate cooking restaurants (the restaurants of former Soviet republics such as Georgian, Armenian or Azerbaijani cuisine are also very good and reasonably priced). It is always good to have a look at the prices of the menu before entering or even look up quickly on Tripadvisor website, the reviews of other tourists. The best way to save on the phone and Internet bill is to buy a Russian prepaid SIM card. For only $5 you have several hundred minutes to talk and Gb enough to connect to the Internet during your entire stay. The best way to save on currency exchange is to make the change in Russian banking entities and make purchases using a bank card that charges you few commissions. I hope that this article has given you an idea of what a trip to Russia will cost you. As you have seen and contrary to what many still think, Russia is not an expensive country to travel. What has been your experience in your trip to Russia?